In the Ecuadorian wilderness just outside Baños, Casa del Arbol is a seismic monitoring station that has capitalized on its perfect mountaintop location next to the Tungurahua Volcano by installing a treehouse with a rope swing. The Swing at the End of the World, as it’s often called, offers thrills with an unobstructed view of the volcano. At Casa del Arbol, you can launch yourself out over a steep drop, about 100 feet (30.5 meters) above a canyon, on nothing but a crude piece of wood. The adrenaline rush is worth it though, as the experience offers extraordinary views of the mountainous landscape and the Tungurahua Volcano. The area around Casa del Arbol is also great for hiking, and there are many other spots where you can avoid the crowds and take in the view. Some multi-day tours from Quito take in Casa del Arbol and Baños as well as Quilotoa Lagoon (Laguna Quilotoa), Cotopaxi National Park (Parque Nacional Cotopaxi), and more. 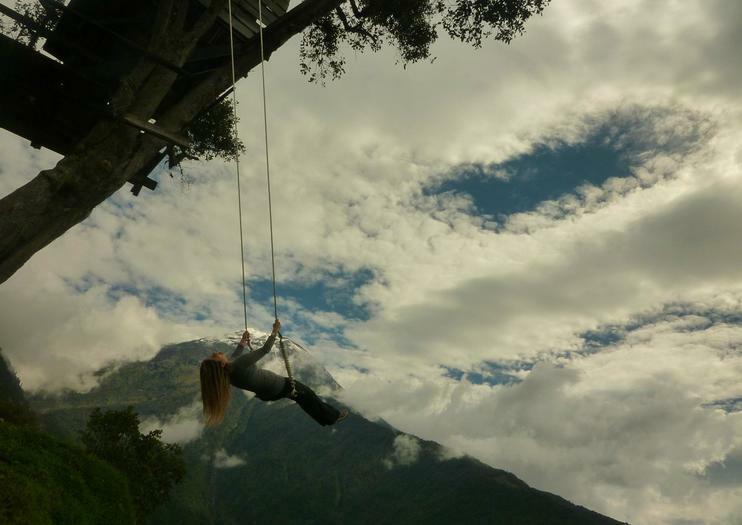 Casa del Arbol is a must-see for adventurous nature lovers staying in Baños. The rope swing is supported by steel beams and has safety harnesses. In addition to the treehouse and swing, Casa del Arbol also offers ziplines, a small restaurant, and restrooms. Wear shoes suitable for walking over uneven surfaces and comfortable clothing for hopping on and off the swing. There are several ways to reach Casa del Arbol, located about 6 miles (10 kilometers) outside of Baños. Most visitors arrive on foot, by bike, or via public transport—an inexpensive bus makes the trip up the mountain several times a day. You can also hire a taxi or rent a car. Casa del Arbol can be visited year-round, however the best time to go is from October to March, when rainfall is at its lowest. If you want to avoid the crowds, visit on a weekday and hike or take a taxi at different hours to avoid all the people arriving on the public bus. Casa del Arbol is a seismic monitoring station for the Tungurahua Volcano, one of Ecuador’s most active volcanoes. The rope swing takes you out over the edge of the mountain and it’s about as close as you can get to the volcano, as climbing it is prohibited. On a clear day, you might even see clouds of ash spewing from Tungurahua’s peak and hear it rumbling. Calling all outdoor adventurers, this 2-day tour from Quito covers the Quilotoa Lagoon and Baños, the adventure capital of Ecuador. Travel along the Avenue of Volcanoes, ride through indigenous craft villages on a mule, and hike downhill to the Quilotoa Lagoon. Plus, you’ll visit the Agoyan Pailón del Diablo and Manto de la Novia waterfalls in Baños. One night standard or premium accommodation, select meals, entrance fees, and transport from Quito are included. Maximize your limited time in Ecuador on a private 3-day tour to Quilotoa Lake, Cotopaxi National Park, Baños, and beyond. Comfortable end-to-end transportation from Quito eliminates the guesswork, discomfort, and unreliability that can come with public buses. Your adventure is made even easier with included accommodation and some meals. Enjoy an exclusive, safe, and immersive experience with a private guide with you every step of the way. Satisfy your appetite for adventure on a private 3-day tour of the Quilotoa Lagoon and Baños from Quito, designed for lovers of the outdoors. Hike to the emerald-green Quilotoa Lagoon, located within an extinct volcanic crater, pick up souvenirs at the Salasacas Market, and swing into the abyss at Casa Del Arbol. Plus, you’ll have the chance to experience activities such as white-water rafting, bungee jumping, and horseback riding. Entrance fees, accommodation, select meals, and hotel pickup and drop-off in Quito are included. Get off the beaten track on this 3-day tour to the Cotopaxi Volcano, Quilotoa Lagoon, and Baños de Agua Santa, a town considered the gateway to the Ecuadorian Amazon. Though this tour is packed with adventures such a downhill hike and mule ride, it also includes all of the comforts and amenities you need for a comfortable trip, including accommodation, entrance fees, transportation, and most meals. Discover the natural beauty of Ecuador with this three-day private tour from Quito. Travel into the Andes Mountains and along the scenic route known as the Avenue of the Volcanoes. Visit several landmarks including the Cotopaxi National Park, Quilotoa Volcano, and the Pailon del Diablo waterfall. Round-trip transportation from Quito is included. If you’re searching for serenity, look no further than this 2-day spa retreat to Luna Runtun ,Baños, or the Termas de Papallacta Spa, nestled between the Cayambe and Antisana volcanoes, from Quito. Travel with ease to your choice of spa, stopping to visit an indigenous market or rose plantation depending on the option selected, and opt to enjoy a relaxing body massage or embarks on hikes to waterfalls and volcanos. Accommodation, select meals, and private round-trip transport from Quito hotels are included. Rentamos todo tipo de VEHÍCULO para cualquier carretera dentro o fuera de la ciudad a buenos precios. Tenemos as mejores RUTAS TURÍSTICAS de país CASA DE ARBOL, ANTENAS, NAHUAZO, BELLAVISTA, RUTA DE LAS CASCADAS A PAILON DE DIABLO, PONDA FALDAS DEL VOLCÁN TUNGURAHUA LLANGANATES ETC. La mejor parte de un viaje es cuando regresas sano, salvo satisfecho a tu casa. Explorjungle - Agencia de Turismo tiene los mejores precios en esta actividad guias certificados aplicando todas las normativas de seguridad eso nos hace especiales tenemos unos super descuentos para esta actividad.Nuestro lema es brindar un recorrido seguro y divertidoLa mejor parte de un viaje es cuando regresas sano, salvo satisfecho a tu casa. Estas rutas permiten apreciar paisaje único de Baños de Agua Santa, es la aventura de cabalgar en caballos, por horas o por días es una de las mejores opciones. Realizamos recorridos afueras de Baños este lugar es Nahuazo, Cascada de Chamana, Casa del Árbol, bellavista etc localizado al pie del volcán Tungurahua. Disfrute de los bellos y maravillosos paisajes en nuestras excursiones en caballos. Recorreremos las faldas del volcán Tungurahua y les mostraremos las partes altas de nuestra geografía.